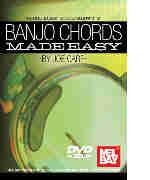 This handy DVD takes the banjo student through all the basic banjo chords then moves into some advanced voicings. Chords are shown in all keys. Chords include major 7, minor 7, 6, minor 6, 9, diminished, augmented and many more. DVD format makes navigating easy. Download now from PlayBetterBluegrass.com!